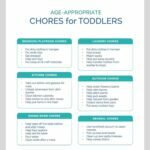 Toddler chores are a great way to introduce kids to chores and begin to raise natural helpers. Below are seven tips to get you started and be successful. “I need to sweep. Where’s the broom?” my daughter asked as she came downstairs. My first reaction was one of shock. “Excuse me?” I blurted out, still trying to process what she had said. But then I pointed to the broom and dustpan and followed her upstairs. In my daughter’s bedroom, she and her 2-year-old brother had torn paper into shreds. And, sure enough, she was using the broom and dustpan to sweep it up and throw it away. Delight would be an understatement, but I quickly realized that this was a natural progression for what I’d been working on since the time she could toddle around the house. My daughter made a mess, and rather than leave it on the floor, she saw the need to clean it up herself. Nearly every time I do a chore, I ask my children if they want to help or do it with me. After all, toddlers are natural helpers, so why not? Doing chores together at an early age is also a great way to spend time together. Plus, research shows that this practice can inspire kids to want to help around the house. For example, as NPR documents, some cultures involve kids in cleaning and chores at a young age. These parents aren’t using sticker charts or allowances; rather, they’re encouraging toddlers’ natural tendencies. The result? Children in these cultures not only do chores without complaining, they often ask to do work around the house. Laundry: You may find that your toddler’s favorite activity is dumping the dirty laundry into the washer. At this age, they can also help put the soap/detergent into the machine. Toddlers will also enjoy pushing the start button to get the washer and dryer started. And when it’s time to dry, hand your toddler the wet clothes to put in the dryer. 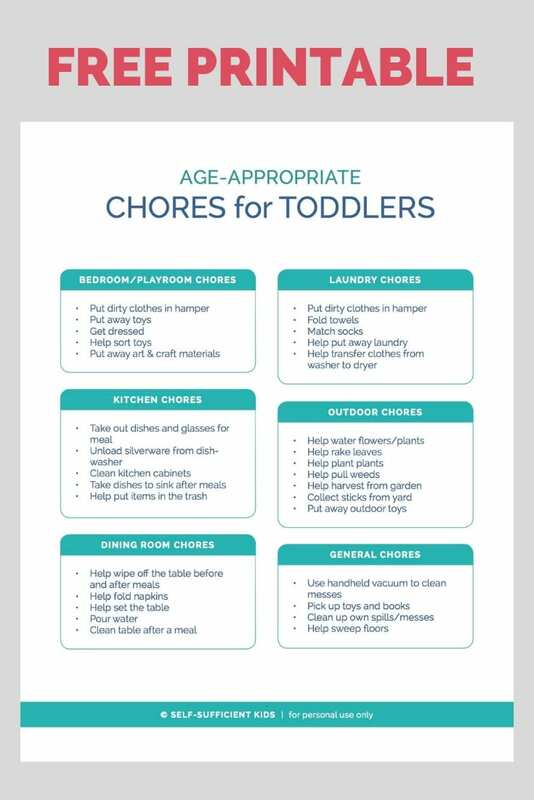 By doing all of this, toddlers are learning how things work (and that dirty clothes don’t magically clean themselves!). Folding: Not surprisingly, when he was 1 (and now at 2), my son was great at dumping out a basket of clean clothes. And now at 4 years old, my daughter is old enough to sort clothes into piles. So even when children are not quite ready to actually fold, they’ll at least play a small part in the process and see you folding the clothes and putting them away. Vacuuming: Toddlers may not be able to use an adult-sized vacuum, but they’ll love mimicking you as they use a toy vacuum. 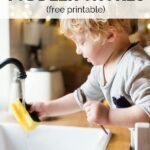 Older toddlers can also begin to use a handheld vacuum to clean messes. Helping with the family pet: This is both of my kids’ favorite chore. They take turns filling the water bowl and feeding the dog. Throwing things away: When you have small pieces of garbage to be thrown away, hand them to your toddler and guide him or her to the garbage can. This also serves as a good lesson in what should be thrown away and what shouldn’t. Dusting: Socks aren’t just for puppets! Put an old sock on your toddler’s hand and show them how to dust. 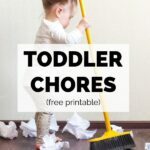 Looking for more toddler chores suggestions? 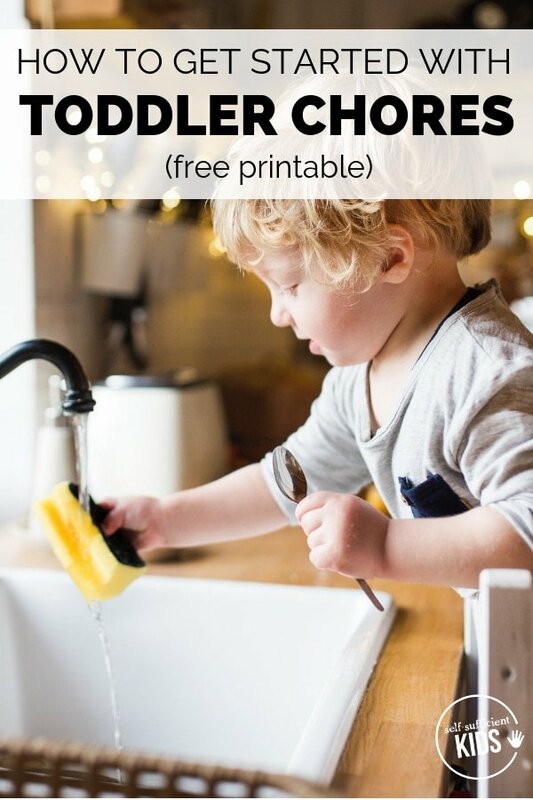 Click on the image below to sign up to my email list and I’ll send you my Self-Sufficient Kids’ Age Appropriate Chores for Toddlers list for free. Toddlers may be natural helpers, but they’re also naturals at making messes and dumping out toys. This act of dumping toys – or laundry – is part of their cognitive development. But it also means that any chore you involve your toddler in can take more, not less, time. So is it really worth it to get toddlers involved? In the short term, maybe not. But in the long term, yes. Adults are naturally in a rush to clean things up and put them away. But young kids tend to operate without that “hurry” gene. This can be aggravating unless you keep the perspective of the long term benefits of getting kids involved in chores when they’re young. According to one study, young adults who began daily chores at age 3 or 4 were more likely to have good relationships with family and friends, to achieve academic and early career success and to be self-sufficient, as compared with those who didn’t have chores or who started them as teens. And here’s another benefit: by doing chores with your toddler, at an age when they’re eager and willing to do them, you’re sending the message that you do chores together, as a team. This teamwork attitude will make chores easier as kids get older – being a part of a team feels meaningful to kids and makes doing chores less of an imposition. Since I work at home, we naturally fell into a routine of not cleaning up during naptime. After all, that’s when I’m the most productive with my work. 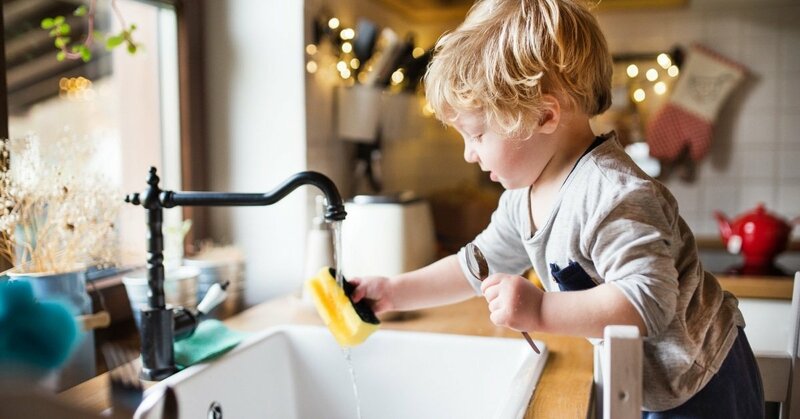 But it turns out this habit can also be pretty beneficial when it comes to teaching toddlers and young kids about chores. Why? If no one is cleaning up during naptime (or doing the minimal cleanup – like cleaning dishes or mopping), then the mess that was there when they went to bed will still be there when they wake up. That means there’s no cleaning fairy who shows up while your children sleep. So even if your kids don’t help with some of the chores, especially larger ones, they know that the mess doesn’t disappear by magic. Make a mess, clean it up… otherwise known as: natural consequences! While this might be difficult for younger kids to grasp, it’s another opportunity to lead by example. Let’s say there’s a spill – hand your toddler a towel or paper towel and take one yourself. Chances are when you wipe it up, they’ll mimic you and wipe up some too. The same works for toys and books. Show your children where they go and get down there with them to clean with them. After all, just like so much of parenting, lead by example. 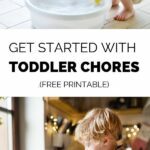 Kids copy everything we do, including chores! Kids thrive on routine and knowing what to expect. That’s why in our house we have a designated clean-up time at the end of the day. After the kids take a bath and put on their jammies, we pick up their bedrooms together. What if they need a little extra encouragement? Sing the Clean-Up song with them. My kids also know that when pick-up time is done we move on to a favorite step in their routine: cuddling up and reading books. Alternatively, set a timer and make it a race! Clean up time is a lot more fun this way for everyone involved, and toddlers especially won’t think of this game as a chore. 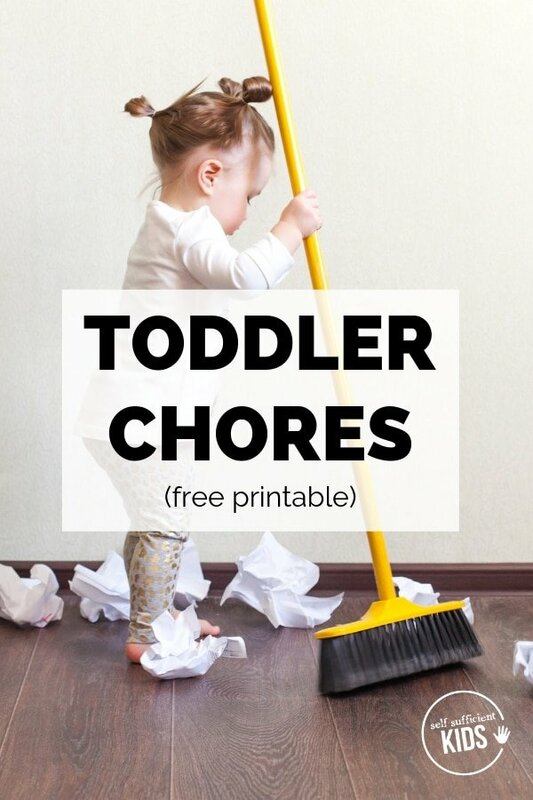 With toddlers helping, chores do take longer…but that doesn’t make our to-do list any shorter. Sometimes at the end of the day – especially on Winter days when we’re more likely to be cooped up – I’ll look around our home and wonder how my kids made such a big mess in a short time. I’ve come to accept the fact that kids are messy, and our house will never be picture-perfect as long as they’re young. That’s life! 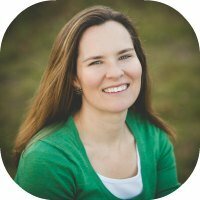 Liz SanFilippo Hall is a work-at-home mama who runs on caffeine and Reese’s peanut butter cups. 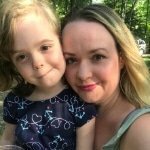 While her two kids sleep (or, when she steals a minute or two for herself), she blogs about parenting and the work-at-home life on Oops and Daises, writes her soon-to-be children’s books, and helps other mamas feel beautiful and confident through her online makeup and skincare business. Interested in more advice about kids chores? 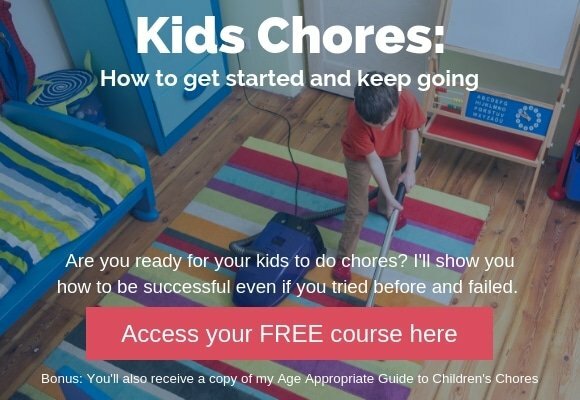 My FREE four-day course will teach you how to be successful with kids chores even if you’ve tried before and failed. Click the image below to join the course. You’ll also receive my Age-Appropriate Guide to Children’s Chores as a bonus to get you started.